Today's VETgirl online veterinary continuing education sponsored blog is Dr. Ross H. Palmer, DVM, DACVS (Colorado State University). Thanks to IMEX Veterinary, Inc. for sponsoring this blog. Please note the opinions in this blog are the expressed opinion of the author, and not directly endorsed by VETgirl, LLC. Somewhere between “no good deed goes unpunished” and “the road to hell is paved with good intentions” sits the veterinarian faced with complications encountered after he or she offered their services to help a pet with a fractured long bone. I would add “life is too short for postoperative complications” to this list of proverbs. The good news is that it doesn’t have to be this way because most orthopedic complications are preventable. Today let’s tackle 2 of the most common – most avoidable – fracture treatment errors in veterinary practice. Both errors are rooted in a desire to help pets & people, but we can learn from our complications thereby protecting ourselves, our patients and our clients from future misery. The radius simply does not lend itself to effective use of IM pins, in part, because of its narrow intramedullary canal. On the one hand, it is typically recommended that an IM pin fill 60-75% of the intramedullary canal; on the other hand, the bending strength of an IM pin is proportional to its radius raised to the 4th power. A small change in IM pin diameter has a profound effect on its ability to stabilize a fracture! In the case of the radius, the small intramedullary canal all but abolishes the IM pin’s ability to effectively control disruptive forces that seek to delay or prevent bone healing (Fig 1). 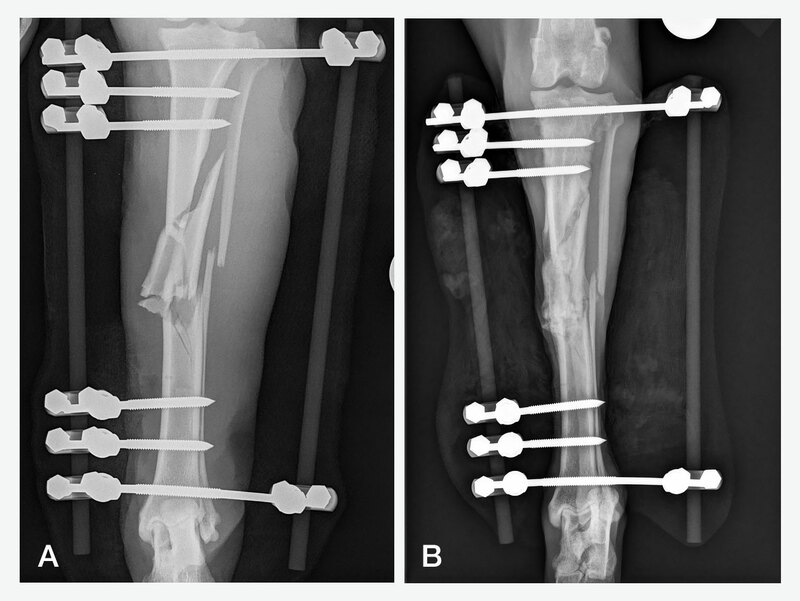 Some veterinarians attempt to augment the fracture stability by adding a splint or cast (Fig 1C), but the combination of internal fixation and coaptation seldom brings out the best of either treatment especially when treating fractures of major long bones. A simple truth: When it comes to fractures of the radius, put down the IM pin and nobody gets hurt! 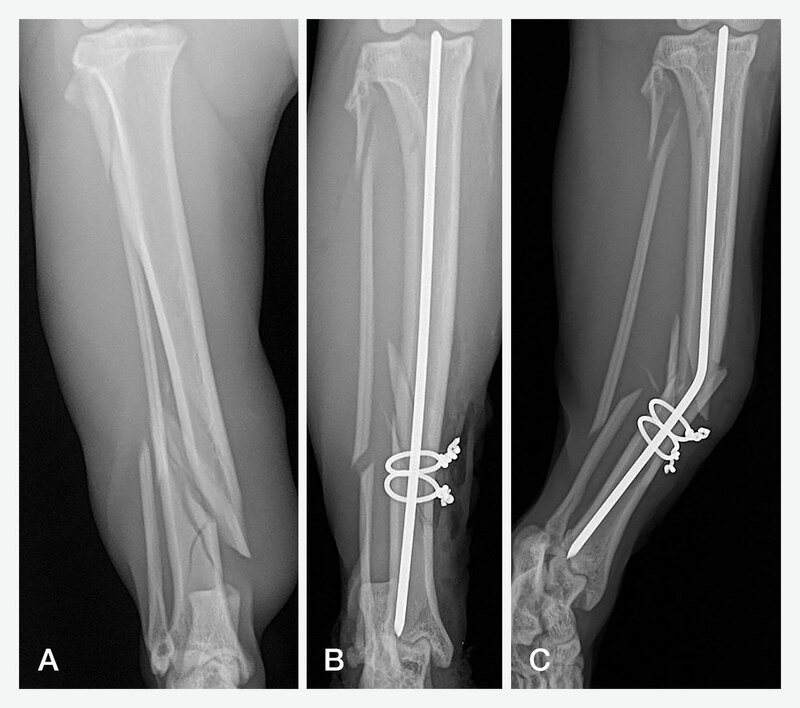 Fig 1 – Radiographs of 3 individual patients each of whom suffered complications as a result of IM pin fixation of radius/ulnar fractures. Intramedullary pin fixation in combination with cerclage wires is an effective means of treating a very few selected fractures. This fixation modality is best reserved for treatment of long, oblique/spiral diaphyseal fracture configurations of the femur, humerus, or tibia. IM pin and cerclage fixation must be avoided in treatment of non-reconstructable fracture configurations …so I guess we better learn to identify those! A non-reconstructable fracture (sometimes called non-reducible) is any fracture with multiple cortical fragments, especially small cortical fragments. Close scrutiny is often required to identify small cortical fragments (Fig 2). If in doubt, classify the fracture as non-reconstructable because fractures are always more difficult to anatomically reconstruct than one anticipates. Cerclage wire fixation requires perfect anatomic reconstruction in order to create the interfragmentary compression that allows exertion of its mechanical ability to resist fracture rotation and collapse of the bone along its axis. Remember the saying, “almost only counts with horseshoes and hand grenades”? Notice that cerclage wires are not on that list because “almost perfect” is not effective with cerclage wire fixation. When multiple, small, cortical fragments are present, it is simply not feasible to achieve perfect anatomic reconstruction regardless of our intentions or abilities (Fig 2). In our zeal to achieve the impossible, we unknowingly compromise the health of the very soft tissue attachments that represent “the lifeline” to these bony fragments. A second simple truth: When you see multiple small cortical fragments on your preoperative radiographs, put down the cerclage wire and nobody gets hurt! 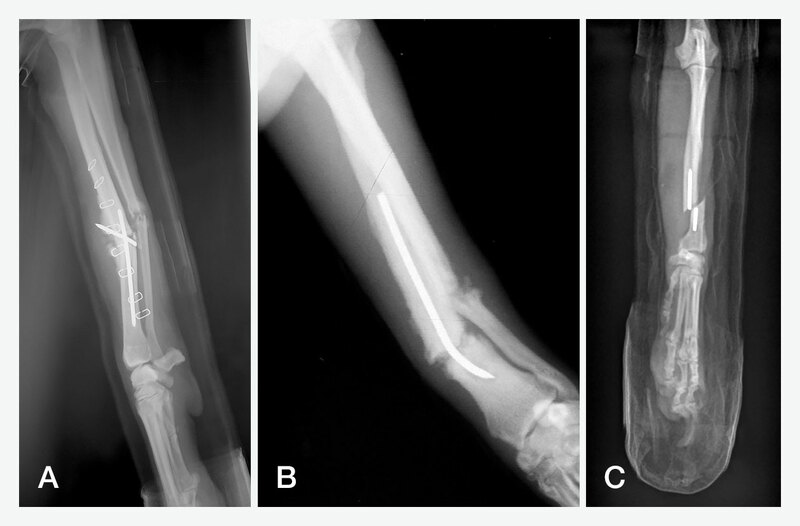 Fig 2: Pre-op (2A), post-op (2B), and post-complication radiographs of a failed attempt to use IM pin & cerclage fixation to treat a non-reconstructable tibial fracture. Note that very close scrutiny of the pre-op radiograph (2A) is required to identify the small cortical fragment that could not be perfectly anatomically reconstructed (2B) and contributed to fixation failure (2C). So what is a veterinarian to do? You may well find yourself thinking that “this all sounds nice, logical and understandable, but now I’ve been rendered incapable of helping the very client and pet that I seek to help”. Not to worry, External Skeletal Fixation (ESF) or simply “ExFix” is ideally suited to grow the spectrum of fractures that can be effectively treated in the primary care practice setting (Figs 3 and 4). ExFix can effectively overcome both of the common IM pinning errors detailed above and do so in an exceptionally “bio-friendly” manner that fosters rapid bony healing. In fact, many of the new minimally invasive plate osteosynthesis (MIPO) implant systems and their application techniques were, consciously or not, developed to ascribe to internal fixation the many inherent advantages of external fixators. Nowhere is this more evident than in the description of locking plate/screw devices as “internal fixators”. 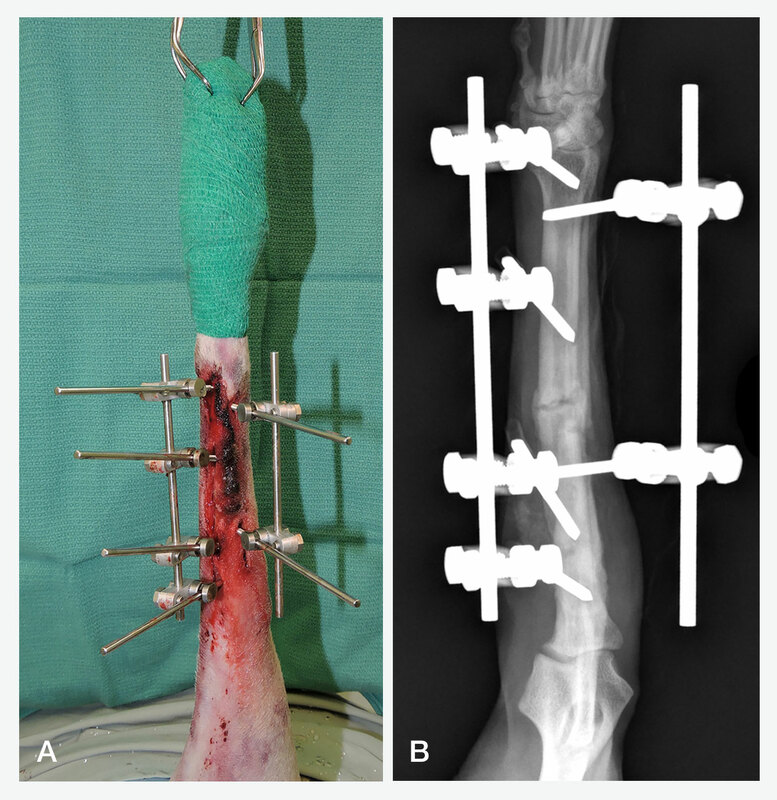 Fig 3: A Type I-b ExFix applied in a bio-friendly closed fashion to a radius/ulna fracture using a hanging-limb position (left). Radiographs made a 6-weeks showed ample healing to permit staged frame disassembly. Additionally, ExFix has the advantage of being affordable as it does not require an inventory of every length of screw, bone plate, etc. and many components are re-usable. Despite the many advantages of ExFix to the primary care veterinary practice, veterinarians should be cautioned that training in ExFix is strongly advised in order to fully realize ExFix advantages and side-step their disadvantages…because, after all, “life is too short for postoperative complications.” If interested in comprehensive continuing education in external fixation, courses like the Complete Course in External Skeletal Fixation are available to assist veterinarians in the path to developing skills with ExFix. Fig 4: A non-reconstructable tibial fracture stabilized with minimal Type II ExFix in a bio-friendly closed fashion (4A). Note that no attempt was made to anatomically reconstruct the cortical fragments; instead, closed ExFix application permitted preservation of fragment viability so that they could participate in the bone healing. Radiographs made at 6 weeks (4B) showed ample bone healing to permit staged disassembly to a Type I-a frame. Thanks to IMEX Veterinary, Inc. for sponsoring this blog. Please note the opinions in this blog are the expressed opinion of the author, and not directly endorsed by VETgirl, LLC. Huge fan of IMEX external fixators here. Great article. As with any form of fracture reduction they aren’t without their own complications but when applied properly to the appropriate patient/client they are fairly simple. Great work! I am also becoming a fan of ESF particularly IMEX ESF. I am learning and optimism is high within me about this practical bone fracture fixation. I hope someday, I can attend the complete course to help develop or improve my capabilities to fix fracture repair of long bones in dogs and cats.